Numero Russia's American themed cover is appropriately timed, eh? 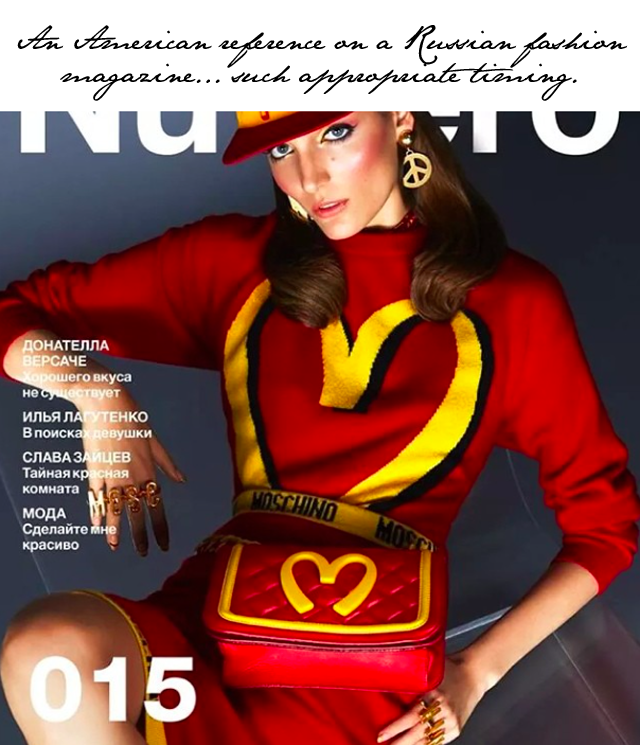 Moschino instagrammed a picture this afternoon of a new cover from Numero Russia which features an appropriately timed American reference, considering today's announcement of further sanctions against Russia from the United States. You may remember Jeremy Scott's collection for Moschino for Autumn Winter 2014 was heavily influenced by American junk food. Mcdonalds, Fruit Loops, Hershey's and many more iconic American food brands were featured on everything from handbags to dresses. And Numero Russia took a look straight from the catwalk to decorate their cover 015. So, today it's quite ironic to see a magazine based in Russia displaying an American influence on their cover. Of course this cover would have been shot months ago but one must see the irony in the image being released today of all days. Interestingly enough, however, there is no other reference to this cover to be found online other than through the Moschino instagram. Could it be that the covers were switched last minute? In all other reports, the 015 issue showcases a woman hiding behind a book clutch. Surely there's a story here! Fashion and politics, seems they're mixing a lot these days. Think Putin will be displaying his copy of Numero Russia in his living room this month?